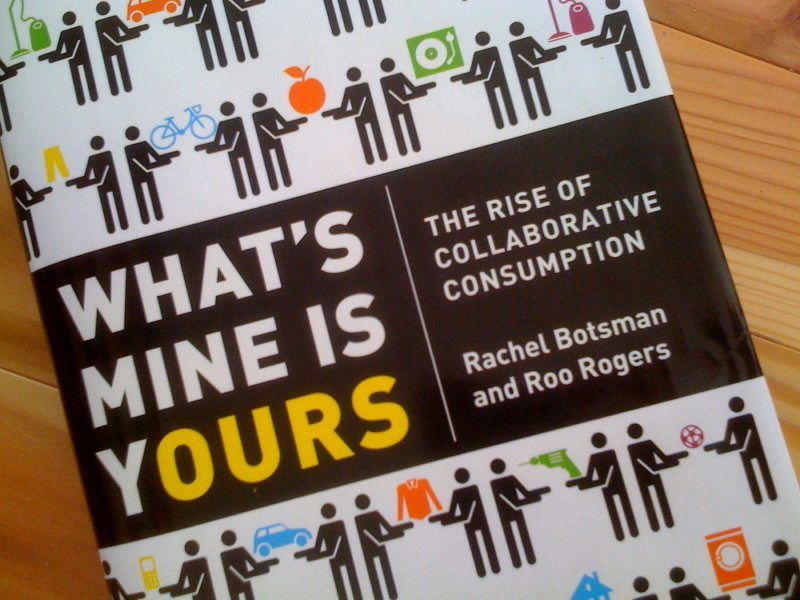 A few weeks ago, I got a copy of Rachel Botsman’s new book, What’s Mine is Yours: The Rise of Collaborative Consumption. The general theme of the book is that we’re shifting away from a society of hyper-consumption and equating personal self-worth with amount of material good accumulated, and instead to a world where our ability to access and exchange resources, develop a reputation, and build community and social capital takes precedence in how we choose to express who we are and what we choose to define us. The authors give hundreds of examples of how people are finding new ways to share and exchange value – what they call “collaborative consumption” – using social lending platforms (Zopa, LendingClub, Prosper), open barter networks (ITEX, Bartercard), peer-to-peer coworking and currencies (Hub Culture), reuse networks (Freecycle), car sharing (ZipCar, GoGet), bike sharing (BIXI), swap trading (SwapTree), and peer to peer rentals for plots of land (Landshare, a room for the night (Airbnb), or any other item you could imagine (Zilok). The list goes on, and the book is packed with some pretty interesting statistics (for instance, did you know that bike sharing is the fastest-growing form of transportation in the world, or that peer-to-peer social lending is set to grow to $5 billion by 2013?). All the examples are broken down in three main categories of collaborative consumption: product service systems, redistribution markets, and collaborative lifestyles – which highlights that there are numerous ways that consumption is being redefined. I loved that in the closing chapters, they pull out “design thinking” as being at the center of collaborative consumption. (we’ve had thorough discussions on that topic here before) The idea is that it’s not just about creating more things anymore, but about thinking from a systems perspective and understanding how to find the balance in the relationship between business, sustainability, and consumption. Our planet can’t handle an endless supply of product creation, so the shift is underway for us to begin to design for participation, collaboration, and enabling new experiences. When this intention is present in design, it can lead to empowerment, changes in the thoughts and behaviors of large groups of people, and advances in conscious decision-making. All in all, if you’re unaware of what’s happening in the peer-to-peer exchange space, this book will quickly bring you up to speed. – The Internet enables a new infrastructure for participation, reducing the transaction costs of matching the wants and needs of people and giving them the opportunity to coordinate. We’re finding this enables us to allocate resources and solve distribution problems more rapidly and effectively. – By taking out the middlemen, people can begin to build trust with one other again. In the online space, this becomes transparent as reputation systems become more robust, revealing our interests, our social connections, and the trail of behaviors and actions across the Web. – The “Tragedy of the Commons” is not a given. People are capable of sharing resources if given the tools to self-organize, coordinate, and monitor each other. – New marketplaces are being built for people to build community, shape their personal identities, earn recognition, and participate in meaningful activity. They are finding new outlets for autonomy, control, freedom, and self-expression. While these activities strengthen social capital, they are also done for very practical reasons – to save time and/or money, to be more sustainable, or to gain access to better services. – Aided by new communication infrastructures, we are learning to find the balance between the pursuit of one’s own self-interest and the greater good. For more information or to order a copy of the book, check out the online hub for Collaborative Consumption. You can follow Rachel on Twitter @RachelBotsman. Thanks for this piece Venessa. Useful to think about this topic. Some human feelings may have to go, for instance, taking pride in driving a handsome, undented car! I’ve noted that the Zip Cars are getting more than their share of dings & scrapes. After all, it’s not “my” car. Correction: Communism would imply no notion of class, and no notion of consumption as a de facto end unto itself. Collaborative consumption is of one stratum, one class; a class that doesn’t share with four-fifths of the planet. No Facebook account? No sharing. It is capitalism remarketed and rebranded, only more deadly. I am also intrigued by the Collaborative Consumption Concept. 1) What would have to be true for Collaborative Consumption to replace a substantial fraction of the GDP, e.g., 5%? 2) What would be the economic and employment consequences of the replacement of Consumption by Collaborative Consumption? Collaborative book reading: usually called libraries. Many of these are coming on hard times these days, with some public libraries being turned over to the private sector. However, one of the operating models for collaborative consumption could be the public library. People pay taxes for it to be available but not everyone uses it. Some of the collaboration is being run by profit-making businesses–I think that’s the case for ZipCar, for example. If we are talking about a straightforward new business model, then that answers the GDP question, does it not? In the simplest form, it’s a question of thinking about what consumer items we each don’t actually need to own, and what can be shared, and kept in common, with a model for sharing, public, non-profit, or commercial. Haven’t read the book, but a lot of options seem to be discussed in it. Thank you, Venessa, for this review. A data point from another industry to illustrate the power of sharing information, and I am talking energy here. Smart Grid is set to revolutionize the technology of energy distribution that fundamentally works like Edison and Tesla pioneered a hundred years ago. The forecast for CO2 reduction by Smart Grid connecting supply and demand more intimately is about 370 megatons per year, about the same as all the currently certified emission credits under the UNFCCC CDM greenhouse gas trading scheme. This is important stuff – actually central – but I am pretty sure the authors are not deep enough, and may not be critical enough to really support the right kind of change. – The people that use these services are almost exclusively those who already have woefully overintensive lifestyles, and thus sharing a power drill or so will not solve the large problem of their unshared car, or worse, their disposable income disposed on foreign air-reached holidays. – Worse, the poorer countries that are now emerging as consumers do not yet seen any interest in such patterns of consumption. – The transaction costs – in the classical sense of ‘hassle’ rather than money spent – of shared stuff is immense. Almost everyone who extols non-money currency systems has never been part of one (I have been part of more than one). They’re sh*t. In the nicest sense of course! But just not good. They don’t work. They are not about getting stuff, so they end up being about interaction, dog-walking in exchange for dodgy haircuts. You might say that’s the point. But when you need medicine or fuel or food (none of which are available on sharing/barter systems), you don’t want to go for a cup of tea with the neighbour to talk about the weather, and a homemade biscuit. – This book seems unclear on why such a vast range of experiments in these areas have not worked in the past. Fair play, we only now have the net, but landshare and timeshare seem awfully similar concepts, and timeshare is hardly everyday practice. You might be thinking, oh I get it, this dude wants the world filled with free-market-fed, solipsistic, consumers, and if he’s environmental at all, it’s all about efficient products. Wrong. Diametrically. I criticise these guys because they are fumbling the most important transition, I believe, in all the transitions required for real, global, material sustainability. And we can’t afford that. About right first time, in our choices for the new world, is what we need right now. Material consumption of consumer products for 9-10 billion won’t work, and we can’t hope efficiency will save us at that scale; but nor will hoping for mass anti-consumption behaviour. So, in the middle, we end up putting a lot of hope – rightly – on consumer-ish solutions like this shift from product consumption to ‘service’ consumption. – distinguishing purchase consumption from use consumption. Once we observe that to buy something is not, necessarily to use it, let alone to enjoy it, we open the way for optimisation of this relationship. – the specific optimisation that we can leverage is NOT JUST more people per unit object. If that were true, while 20 people per car would be good (about the average ZipCar and similar will work to), 2000 or 2 million would, in theory be better, which it clearly is not. Instead, the optimisation is the EFFICIENT ALLOCATION of commodities to usage dynamics of consumer-ish citizens. – this is the crucial point, because it’s where design steps in. What these authors, and most people working in this area, fail to get is that there is a massive, epochal difference between ‘peer-to-peer’ systems of resource allocation, and ‘sharing’, concepts which are basically conflated in such work. (E.g. Zilok is called both peer-to-peer rental, and a sharing system.) The two key differences are that in the peer-to-peer system (by analogy of computer networks) the a) PEERS FUNCTION BETTER THE MORE PEERS THERE ARE, and b) THE PEERS DO NOT ASK EACH OTHER FOR PERMISSION TO ‘SHARE’. Almost the entire edifice of thought elaborated by this whole sphere of work (if you want the academic version, read Yochai Benckler) are these difference. Sharing is not peer-to-peer because a) the more people there are, the worse and more complex the system is, and b) in sharing systems, the users have to ‘ask’ each other to engage. – sharing systems are SOCIAL INSTITUTIONS which have no definition of efficiency attached, and which DEGRADE with scale. To take the best example. Skype. Skype has ’20 million’ users online at any one time (check your client, look in the bottom corner). What are they doing? They are not ‘sharing’ their internet connections – you don’t phone Mexico to ask the guy in his underpants if you can borrow some bandwidth to route a call. But they are having their calls routed through a peer-to-peer network – which automatically allocates unused bandwidth on the network (including Mr Mexico in his pants) so that the calls are free. Same abstract principle (many-people-connected-use-of-less-resources), but totally different application. More basic than distinguishing the principles of system optimisation of resource allocation (peer-to-peer) from moral injunctions to organise your stuff with others (sharing), is the fact of transaction costs. What most theorists – or rather entrepreneurs since the research is way behind the practice – in this area don’t get is that the competitor of the ‘shared’ or even ‘peer-to-peer’ product is not the ‘new’ product (i.e. is not purchase consumption), it’s the ‘already owned’ product (i.e. use consumption). That is to say that, even before system volume and other design issues facing Zilok, there is truly awful problem confronting the fact that people have to ‘book’ and ‘get delivered’ stuff that they would have IN THEIR CUPBOARDS. This is the nature of the transaction costs. Buy once, use many times vs buy many times. Even if we save money in this deal, the gigantic mess of small transactions will kill these systems (that’s my prediction for Zilok, Ecomodo and such). Far from wanting these things to fail, they HAVE to succeed. I really don’t see much else working. That’s why I am down on vernacular thought in these areas. We need good – amazing – design with analytical rigour, not some call to ‘share’, in particular from people that have never done it. That’s my penultimate point. These guys are totally lacking in credibility when it comes to most of the ideas they explore. While Roo Rogers is involved with OzoCar (like ZipCar), great, the very failing of his own strategy comes from that project itself: if alternative currencies were so great, why not implement them in his own businesses (like OzoCar). Yeah. Dogfooding as Microsoft calls it (“eat your own …”.) I just don’t believe these guys have serious experience of designing, let alone living within most of the ‘sharing’ systems they are proposing. Thankfully, as a final point, we don’t need to listen to the sharing theorists: we can watch and learn from the peer-to-peer system developers. Skype is pretty simple example. But once you get the point, differentiating system-designed p2p from social-institution sharing, we can start to observe it everywhere: GMail (all webmail), Google Docs (all cloud computing), and the whole networked computer architecture (i.e. grid computing). I like the idea of having a critical discussion about new economic models such as those that are discussed here. It’s good to go a bit beyond the surface of nice and appealing ideas (and Venessa’s blog is usually a good place for such discussions!). For example, I can’t help feeling the same as John when he expresses his doubts about the high transaction costs of sharing models and how their efficiency might degrade with scale. At the same time we certainly need alternative ways of allocating resources to build a sustainable future for ourselves and our children. John suggests P2P as a good system, but I would like to hear more about the efficiency and feasibility of such models for “non-digital” products : how can P2P drills, cars or houses work? Any examples and good stuff to read about the implementation of P2P model? I would also love to hear from Rachel or Roo about the critical comments on the model they promote (not about the personal criticisms… I’m not interested in those! ): what’s their point of view on transaction costs and on scalability of sharing? We don’t have a true p2p model I think in any commodity situation, and I think that is very much to do with the logistics (electrons move faster than power drills). But we get close to the implications of p2p in things like ZipCar where there is a management layer. I think the question starts to devolve to the system design. If we design apartment blocks without a serviced commodity feature, or a city without a carshare system, they are hard to create, because what we end up needing to avoid the logistics problem is localised storage (i.e. a box for equipment on your floor of the block, or distributed parking spots for ZipCars etc), as well as infrastructural support for a management layer (e.g. cabling into apartments, offices, etc) of such a system. p2p in other words doesn’t just rely on networking, it relies on the possibility that system design overhead can be included in the consumption model. Right now, ‘sharing’ models can’t accommodate that. By the way, I don’t think it’s personal criticism to question people’s backgrounds and credentials. I don’t say they are not good, nice, or well-intentioned people. In fact, they by definition are well-guided if they focus on this! But we need to be critical of people’s behaviour, if they suggest ours should change, and always critical – in the sense of disciminating – of their ideas. So, being credulous about the viability of sharing without a p2p system architecture I think is simply dangerous. That’s I think viable criticism. And questioning whether alternative money systems work, when one of their exponents is not using them for one of his key ventures, is also worth asking. John, it seems that this criticism hinges critically on the scope and scale of the proposed sharing system. Systems that propose to ship physical items over significant distances at significant scale will likely be subject to all the criticisms that you note. On the other, I can imagine sharing systems working relatively well at small scale. Suppose I need a vacuum cleaner (I do); currently I am prevented from asking my neighbors to borrow their vacuum cleaner largely by social custom – unless we have a very well established rapport this request would be viewed as an imposition and my methods of compensating them would be limited. However, if everyone listed their needs and offers on an open website, then I would have no need to impose on people who might be put off by the request. I donn’t expect such systems to have the same game changing potential as the alternatives you propose, but they certainly would increase efficiency at the margin. So it would seem I am agreeing with you that the authors are conflating two different angles. If we are talking about strategies that can help the consumer save money then certain sharing proposals might belong in the same discussion with P2P. If we are talking about strategies that have the potential to significantly affect economy-wide resource intensity of consumption, then sharing is not scalable enough to be part of the same discussion. See below, Greg. This column now officially too narrow. “… ushers in the possibility of new motives for corporate social responsibility. Not only will the corporation be asked to be more accountable for its actions, perhaps the corporation can be encouraged to invest in ways for its social connections – consumers, suppliers, employees, investors, owners, analysts and value added resellers, etc – to move beyond feel-good CSR tactics towards a relationship in which the opportunity is seized by each forging identities based upon greater social contribution. As I have noted before, there are implications throughout the corporate ecosystem. “Clarity of shared purpose and principle”, “mission statement” (which is a term that has been around for a while), community values … there are many ways of describing the need for self-organisation through unity of purpose that is characteristic of the era that we live in. Thanks for this, your recommendation is my first purchase of the week. We are trying to do what you outline with http://www.thinklabuk.wordpress.com Looking forward to an interesting read. I believe peer to peer exchange will be fundamental in the successful businesses in the future. Sharing not protection will be common. Personally, I can’t wait until we are truly collaborative, taking us down deviant streets of intrigue, curiosity and discovery! The blunt critique is that we cannot change assumptions and behaviour sufficiently to make sharing systems work. The sharp critique is that we don’t need to work on that line, because we already, in so many instances ‘share without sharing’ in a high-end, designed, managed, way. I guess where I get grumpy is in vague thinking being pushed forward, proposing changed behaviour that no-one can implement. This just doesn’t help. No-one is sharing. Least of all Roo Rogers. But there is a vast shift towards accessed goods, which don’t have a sharing dynamic, think all your p2p online services, but also such things as ski-hire vs (10 years ago) ski-purchase, and we need to put analysis and design under that rather than wasting energy on social moralising from a very weak standpoint. Again – I’d love to see sharing happen. I can, personally, stomach some of the transaction costs. But realistically, India and China and Brazil, coming out of comparative poverty despise the idea that they ‘should’ continue to ‘share’ because it is ‘good’. They want consumer-ish lifestyles. We have to design and deliver those, at scale, right now. Sharing doesn’t cut it. I don’t think I should be commenting on this blog, temperamentally, because I don’t believe that sheer enthusiasm creates change, and I fear that the CSR-blah, ‘paradigm shift’, and general cheerleading character of some of the comments above is not my cup of tea. I think it’s a bit of a struggle to create systemic change. We need to be quite intellectually rigorous, and very self-and-other critical. I’m not even talking about ‘the powers that be’, clinging to power. I’m talking about our own ability to delude ourselves we are making a difference just because we are looking in roughly the right direction. The shift to collaborative consumption is not going to be linear. It will be disruptive. Discuss. Another excellent post and discussion. On John’s points about transaction costs, I wonder if we can differentiate more explicitly – as has been mentioned by Emile – between things that are digitally shareable (ideas, knowledge) and things that are not (drills, cars, guitars, land). It does seem easiest to create digital sharing environs and gain efficiencies of scale, while it seems harder for physical assets. It also seems that the physical assets can be further divided into things that are more readily mobile (like cars) and those that require effort to transport that is separate from their natural role. Say, for example, I’m traveling and want to borrow a guitar at my new location – it’s worth something to me because a round trip with a guitar these days will cost your $50 from your favorite airline. In these instances, I am the sharing vector because I find value in the cheap room or the borrowed item – it saves hassle and money, which makes up for the inefficiencies of non-digital assets (to a point). So is there some formula (or regression algorithm) here for understanding the relative value of transaction efficiency and value? Even for borrowing the neighbor’s vacuum, there seems to be a point where the awareness of a borrowable item – made sufficiently efficient because all items are RFID tagged and make calls to the ether as to their presence and status, etc. – is so low that it crosses the threshold of transaction efficiency and works. I can think of several other similar notions, but would be interested to hear what others have come up with that would be factors in this equation. Whether or not these special cases – mobile guitars etc – will amount to a save of the inherent transaction intensity of sharing is somewhat unknown. One thing to consider however, yet another in the vast list of critiques against naiive sharing concepts, is that the engine of production efficiency marches on inexorably. So, if you are ‘saving’ money in the round by your sharing tactic, remember that this strategy has to, in the long run, save more money than the market is enabling you to save by making guitars and flights cheaper. I.e. you might get a system running that works because, for a certain class of goods, in the round, 5 dollars is saved (e.g., fake example, http://www.sharemyguitar.com) for each mobile use of a guitar. But that system is at threat of cheaper guitars/cheaper guitar haulage. Really, though, we need much bigger and more secure wins that this. Part of the analytic problem is the assumption that we must think at the unit scale and then try to step up to the system level: myself, I believe that’s unlikely to be effective. Products are like cats – once they are out of the bag, they are difficult to herd (that’s a mixed metaphor, but quite what I want to say …). But if you keep them in a basket then they’ll stay orderly. As it were. I.e. think systemic in product allocation, not unit, as the system architecture. What this means in practice is the we buy in bulk, allocate to specific user ‘systems’, and then ‘consume’ in relation to them. We don’t but in units, and try to retroactively create systems out of already individualised consumer items. Example: ski-hire. Ski-hire involves bulk-purchase of skis calibrated to the presumed use intensity and user profiles during the season (numbers of what kinds of skis in what sizes, ensuring that there’s enough skis for peak demand). The ideal p2p supported ski-hire system doesn’t exist yet, but it would include (some of which may exist) pick-up and drop-off more or less anywhere, perhaps remote drop off (in case you accidentally take them back to Paris with you), load-balancing (i.e. if one shop/resort runs out, another takes up the slack and sends over a buggy with some skis), and spatial infrastructure to facilitate all of the above (drop boxes outside hotels, etc). Here, we are getting to the operational equivalent of your ‘guitar sharing’, without the transaction-intense sharing. I.e. the system is designed to deliver the right result. So the key systemic set-up there is scale, and managed arrangements, but one crucial feature in that set-up is the spatial configuration. The difference between real-world and digital p2p is largely spatial: stuff takes space, and sits somewhere until moved, whereas electrons can get to the moon and back in 2 seconds flat. There’s no obvious way to move physical stuff around fast, but the best interim solution is to put to the right amount of stuff in the right place. So to blend all this, in the guitar example. Rather than borrowing guitars in unknown places (perhaps http://www.guitarsurfing.com is the real idea here), join http://www.globalguitarclub.com, and know that every town you go to (or at least the ones marked on your smartphone map), you can go to the guitar locker, and pickup a guitar, or pre-book a guitar, or whatever modality works. The managers of the system will have to calibrate supply to demand, but then it’s the same for ski-hire, just on a large geographic scale (and likely smaller volume). One thing to add here is that, to counter the obvious point that http://www.globalguitarclub.com is likely to an expensive thing to deliver on, the best result is actually that it does cost a bit more than your ‘borrowing’ scenario, but you get a much better product. The system ensures that paying guitarists have access to good guitars. Again, the ski-hire system is the model here. Ski-hire means you get the best skis for a price, against how much one is playing, is really great. Look me up on academia.edu to find a conference paper where I outline some of the key concepts, and explain why it’s so hard to grasp the clear problem/solution thread in this area (one reason: economics does not want us to propose PC – UC disparity, because it deep down favours production maximisation, not consumption efficiency). All of this analysis is rendered much easier if we have ‘cheats’ like RFID, which give object IDs and locations. This is obviously a huge part of the solution. Most of this is the basic analysis of the problem. Commercial projects should leveraging all of this already. If anyone is working building any concepts/models/systems in this area, whether research or commercial, feel to be in touch via the link. As I say, collaborative consumption is not about collaboration, any more than getting on the bus involves ‘collaboration’. It’s not linear, it’s disruptive. It’s not sharing, it’s efficiency. The title of the book (which if I can get off this website, I’ll get back to writing, :-)) should not be ‘what’s mine is yours’, it should be ‘what’s mine is sitting in my cupboard, and so is what’s yours … let’s let the market do its job properly and deliver efficiency consumer /experiences/ through designed, managed, optimised and spatially arrayed access-service-experience consumer systems’. Not so catchy maybe. Giving a lecture and workshop on this at KaosPilots white week next week. Okay, maybe not the catchiest of titles for mass market consumption, but it does get the concept across at least as well as “Snakes on a Plane.” How about “The Indian (Giver) in the Cupboard”? Or “The Supermarket in Your Cupboard”? — ToothbrushTrader.com – Shareable things can’t be too personal. — SoapBubbleShare.com – Shareable things need to have a shelf life – generally the longer the better. — iPHONation.com – Shareable things can’t be so ubiquitous and personally customized that there’s little incentive to share them — or so portable that they are easily stolen. But, hey, that’s a cool URL — and it’s available! I’m too busy to go commercialize it, but if you do, be a pal and send me a royalty check or bad karma will hunt you down and, well, do appropriately bad karmicky things to you. Okay, I digress. But it seems to be a good way of looking at the concepts. One last thought that I forgot to include last post: John, you talked about the semantic differences between P2P and Sharing. Fair enough. But, like your proposed book title, Sharing is a better brand for the notion even if it is less accurate. “Inclement Climacteric” is possibly more precise a descriptor, but “Stormy Weather” will best it on the top-40 charts every time. Sharing is not the word to use. Because it’s not the concept to use. The underlying physical fact is many-users-one-product. But there are masses of different instantiation-classes of this fact, only one of which is ‘sharing’. Sharing is one where personal relationships are key. P2P is one, in the digital case, where personal relationships are deadly. If you use that word, you’ll be falsifying the situati0n. To be fair, we don’t have words for the fine grain of options. Ski-hire is not ‘sharing’ (no social relations) but it’s not (yet) really P2P. Nor is it just rental (too much service attached, e.g. boot fitting), nor is it really service (because it’s mostly hire), so it’s really an ‘access sales’, but that’s hardly a name, etc. Actually, in the end, the name is not the right approach, at least from a marketing perspective. Because people don’t care about the modality, they care about the experience. That’s the key point. Without wanting to give to much commercial design advice away, my guesstimate is that myriad hybrid models will emerge, and they will mostly not /have/ names. What they leverage will have names, but with the product-provisioning system hardly visible. For example, who knows what the various networking or mobile protocols mean? Analogue? Digital? GSM? GPRS? CDMA? HSDPA? DSL? ADSL? And who cares? No-one sells phones seriously by flogging those names. So, sooner or later, sharing/access/service/ whatever will be what economists (or, better, when economics has been banished to the cupboard marked ‘nonsense superstitions’, and system design + entropy theory + psychology has taken over, system designers) will talk about, while ‘we’ citizen-consumers talk about the materialised experiences we get, in whatever variety of ways. If we want to talk about sharing, we’ll do it to talk about the human interaction dimension (which it maximises), not the product-manipulation dimension. Not to get political, but “death panels” isn’t accurate, yet it is what one flavor of politician used to kill a perfectly benign and appropriate component of health reform endorsed by another flavor of politician. Branding isn’t about accuracy; it is about appealing to the market you seek to attract (or repel in some cases). The best mobile protocol might be the Circular Radioscopic Ultrawide Digital network, but folks are not going to flock to the CRUD network no matter how accurate the moniker. Sharing can be the word to use if it conveys a notion well enough and gives an added sense of altruism or collaboration or greeness. Corporations understand this part of us well and often exploit it to maximize their reach if not their reputations as honest brokers. Even the EVDOs and 3Gs (clearly superior to 2G but wait! — here comes 4G! — at least those are numbered so you can guess at the rank order) tell the average consumer nothing whatsoever about the strength or reliability of a network are used as marketing tools to confer some level of quality. I’ll defer to you on the last word regarding this tangent of our discussion as it’s very secondary to the original thread concerning the design of peer-to-peer exchange. More to the topic: You said that “people don’t care about the modality, they care about the experience.” That’s true only for people who care only about the experience (cheap shoes? awesome!) and not about the modality (child slave labor? no thanks, I’ll pay the extra ten bucks). Part of what I gather is motivating the folks commenting on Vanessa’s blog over these last few months is the notion that transactional efficiency can’t be sole definition for a “good” transaction. Pull the lens back and you find that the fuel efficient hybrid does more damage to the environment because its battery polutes when disposed of. We’re seeing that if you solve for the localized/personally focused efficiency, you may not get what you want when the tragedy of the commons plays to its final act. So a part of the efficiency equation includes some fudge factor we sometimes call altruism or tree-hugging or some other notion that we becoming willing to take it on the efficiency-chin for a broader cause. What I think is so important about figuring this all out is that it is relatively easy to tap into this greater-good intention and not so easy to point that energy in the right direction. I have no interest in making people feel better about themselves by spending an extra nickel on a can of tuna to save the dolphins if it doesn’t actually help. My intuitive sense tells me that concepts like social sharing / collaborative consumption is closer to the right direction for our global needs. I’m drawn to these ideas because they feel right to me, but I want to use my brain and the brains of others to answer the skeptic in me and make sure it isn’t just another gimmick. Your headline “the rise of collaborative consumption emergent by design…” and your subject is distinct. Like a song from Madonna: I´m a material girl – i think, it´s realy true. whoa, its not often such an old post gets freshly pressed! congrats and well informed post. Yea! What a wonderful summary. We are seeing more and more a shift from marketing based design to user centered design, more and more people outside of the usability and design worlds are beginning to notice the importance of user success. I would love to see some examples of designs focused on sharing in a future post. Thanks for the great blog, I just discovered it but can’t wait to read more! Serious thinking . And now talking. The awareness is where it all begins . Great go . Thanks for the info. I have to get this book now and read about it. I’ll have to blog about it as well. Thanks. Thanks for posting about this, very interesting and thought provoking read… I have to admit the title about Collaborative Consumption would’ve completely put me off, if i had seen it, say- in a book store or library, but I actually find the ideas here very interesting…. Great post. It’s interesting to read about collaborative actions outside of the Internet (a la Clay Shirky). On a funny note, when I think about it I’m sure right-leaning Republicans would call the Internet and other collaborative actions and technology an act of Socialism if given the chance, lol. This looks like a good reasource and of course I am commenting without reading the book – but responding to the post and comments. I and my friends have been involved in sharing resources for a while. Two issues that may be challenges to take this idea on are a) much of the stuff that we use (personal network not scientific fact or social research) are the remainders of a wasteful society. If we did not toss so many good things in the trash, I would not find them dumpster diving. b) the… um… middle class effect. I know it’s rude and un-PC but it also takes a common community to share resources in a culture of trust. I think of craigslist as an example. There was the craigslist prior to it being “discovered” and that after it was discovered. After, there are more scams, seedy money-for-nothings, etc. Point being, I am not as positive about the whole trust thing being created based on the online community however, online does allow for greater sharing. It’s a hopeful work and I now plan to read this book. I just joined Home Exchange.com today, for instance, and love the idea of swapping homes and cars with families in other parts of the world – how otherwise can one afford taking a family of five to Europe? So cool that we can connect with other families this way. Amazing. On the other hand, just wrote on my blog (reganrants.wordpress.com) about our children and how consumerism is heating up at an unsustainable level with their cohort. Interesting trend. There are some goods people will always want or need to own for themselves, but we do need to learn to be less materialistic and more cooperative in our society. great information in this post! kind of want to go to a nearby bookstore and check this book out. Very insightful, thanks for informing me. I’m new to this topic, but I’d like to subscribe to you and dig a little deeper. When you have a moment, please take my quiz, it’s about overcoming your fears, if you have any, and taking action in life. Best to you and congrats on being freshly pressed, well deserved! This will be added to my book list: As my first day blogging, I’m happy to have stumbled upon great material. Check out my dating blog, it’s an effort to teach “The Game”, one clueless soul at a time. Hi – I saw this blog on the wordpress homepage. I run http://www.transitionconsciousness.org. I had not seen this book before so thanks for bringing it to the world’s general attention and good luck with your blog. A very interesting topic. I like how design thinking is being used in this instance and the idea that it can be used to change or alter some of the very basic premises of modern economics. Thanks for sharing. I think it’s good to see. In England there’s been a real move back toward local produce, supporting the community producers etc. It’s like without realising people have become bored with the large coporations telling us where and what to buy, wear and eat. There lots more eco hotels springing up like this one http://www.tulumboutiquehotels.com/zulum-beach-club-hotel.html where people let go of the “constraints” of daily life and learn to unplug and relax. Excellent article, will be digging deeper. I’ve not heard of that book, but I shall check it out. I’m Gabriel an uruguayan born living now at Spain ( Catalunya ) in the pretty city of Barcelona. Your post hit me !! At my childhood, 1960s and 70s lived at a little neighbourhood in Montevideo, and my experience was completely of Collaborative Consumption, its seemed like if nobody owned all, and write – in my blog – an article about it, please if you could translate read it ! thanks gabriel…. i tried using google chrome to translate…. not perfect, but i understood what you were saying about the sharing culture in Pocitos. thanks for the share. Great article. I’ll mos def pick this up. I love reading conversations about society’s changing attitudes toward consumption. Consumption like this is increasingly relevant to other growing trends like conscious consumer spending, corporate social responsibility initiatives, and social ventures. These combined forces will lead to some pretty interesting ways that businesses conduct their business and consumers think about their purchasing decisions. Feel free to check out my blog about how business is connecting with social causes. I’ll have to check out the book which you discuss too. Interesting, and thank you for the post. Given the current economic situation and forecast I can only imagine this kind of social networking/social capital situation will get stronger in the future. It won’t really address social exclusion, because exclusion is by definition exclusion from available routes to building social capital, but I think it will become important for the rest of us. I’ll certainly check out the Hub in the not too distant future. Congratulations on being Freshly Pressed from all of us here at http://www.allovernews.wordpress.com consider it an honor to be Freshly Pressed . So great that finally we are moving out of denial into change – if anyone out there has not yet spent time viewing http://www.storyofstuff.com/ do yourselves a favour. I am thrilled to know that my children will be growing into a world moving away from the oppressive economic patterns of the past! This so reminds me of my marketing and international business lectures. The real issue here is your asking people to do more with less. This is a simplistic version of the “real” all high and mighty people. I thank you as I will likely preside as the commonwealth of the future. Lets get down right to it. We know how social dynamic occurs, we know whats it capable of producing. High-end effective products that nearly automatically connect worlds and social groups to new personify their identity. Your issue on and into itself. As you see the cost lower you presume they need less and we all know the social dynamic occurs from more finance with accessibility to more from and for less cost. We see this rampant throughout business, the structure has created little support from its foundation to gather and reorganize. It makes us believe your protecting a whole lot of a little, still at this point the little is a lot more than we have. It is possible your scare to create the second pillar as it may tower the one that is there so greatly it could be as if you didn’t exist at all. Rest assure I have placed my mind on future sights and you all do survive. Thank the men of the early 1900’s though. What we find is that little bit of down sight from an instable top tier likely isn’t enough to write a book. Your insight can be paraphrased to “if we torment the public and starve them of finance by keep the economy under constant stress we will conduce comraddory. Your asking for rebellion that is unnecessary. Unfortunately Until the one institution that exist can create one larger than itself it continues to fail all together. I was a tad-bit incorrect. The a controlled rebellion is necessary. After looking at how we use Facebook and why we use it. The reason people use Facebook is the lack of allowable social interaction. It is a fully balanced measure. The lack of lives we are allowed to lead makes people reliant on one another. The more attached we become in other ways to the same social connection. Divide a man by prison bars and he write letters, divide him by his house and he makes phone calls, and more dynamically divide him from phone calls with a phone and he send text messages and so on and so forth. Our lives will be a struggle for sometime as if Facebook and other social interaction we set out for us with little input we would disregard them. The discovery of the capabilities of Facebook and social networks comes from the time of their use. As dependency is forced by one measure we are squeezed through an experience creating independence with the need to share social connection with one another. The next phase is the organizing of these social interactions, we begin to want to share this in actuality rather than media based. After this struggle and our capabilities are recognized we will have social worth and financial worth as well. This ability of financial expenditure will create neutral and mutual agreement, comraddory. For the hopeless romantics, this is where friendships, love, as well as good business lays and what it stands upon. I suppose I write this to let you know your hope will pay off and if your struggles are overbearing we are succeeding, together. Hold on to your beliefs and representation. It is closer then it is far. For more information on my company visit http://www.decisivedecisionsmarketing.com as well as view our article blog right here on wordpress. I feel like a lot of this shift to more social interactions has to do with the uncertainty of the economy. Maybe people are seeing the relevance of the whole is more than the sum of its parts theory.